This! This is the kind of thing we’ve been working toward. Haydn’s next quartet (reflecting the order in his own catalogue) is the string quartet no. 23, or to be more precise, the op. 20 no 5 in F minor. The quartets are considered a milestone in the history of composition; in them, Haydn develops compositional techniques that were to define the medium for the next 200 years. … The quartets were composed in 1772 at a time of tensions in Haydn’s life, and also when Haydn was influenced by new philosophical and political ideas sweeping Europe. Some analysts see in them the impact of these emotions and ideas. It sounds exciting before I’ve even heard it, and if this quartet is any indication of what’s to come, we are in for a set of six stupendous string quartets. Interestingly, he was not a young composer breaking out into the world of music. On the contrary, it was 1772, a decade after this past week’s symphonies, and the composer was 40 years old, “already well-established as one of the leading composers of Europe,” says Geiringer. Haydn was, as you may know, Kapellmeister at the Esterhazy estate, being employed by a man who apparently adored music, and Haydn kept the stuff coming. … it was humid throughout the year, with a “vexatious, penetrating north wind” from which Haydn and the other musicians in the court suffered. Moreover, it was far from Vienna, and the musicians (Haydn, as Kapellmeister, excepted) had to leave their wives and families behind for many months. Consequently, there was much discontent among the musicians, and Haydn, like the others, suffered from bouts of depression and illness. Perhaps now, not only do we have some context or background into the work, but also something that makes him sound more human, struggles and emotions that people can identify with. It isn’t as easy (or endearing) to identify with genius as it is to unhappiness or sheer joy. Or oppressive heat. We know about that in Taipei. 1772 is two years after 1770, and who was born in 1770? Beethoven! Ten years after this week’s early symphonies brings us to the cusp of the precursor to the threshold of the Romantic era; that is to say, not even ‘almost there’, but ‘almost almost there.’ Things were changing, and Haydn obviously reacted and/or assimilated (perhaps caused, in some cases) these changes into his work, so we’re in an interesting period of development not just for Haydn himself, but the world of music as a whole. That’s my foreword to this phenomenal work. It’s a minor quartet. While much of what I read in Keller’s book about Haydn’s quartets has since been tempered by more listening experience, he still had something about the special-ness of Haydn’s minor-key quartets, and this is one of them. The opening is somber; it has a longing, yet almost pallid quality about it. From the beginning, we hear that the first violin takes the lead in this quartet, but not to the detriment of the other players or the overall quartet sound. Something else you might be aware of (not at first) in this work that gives it a more modern sound is that it isn’t made up (at least not as obviously) of clearly delineated, resolved eight-bar phrases; rather, it contains long-ish lines that continue in a larger arc, at least until, we’re presented with an almost shockingly sweet new subject in a major key, so bright and warm it almost makes you squint. 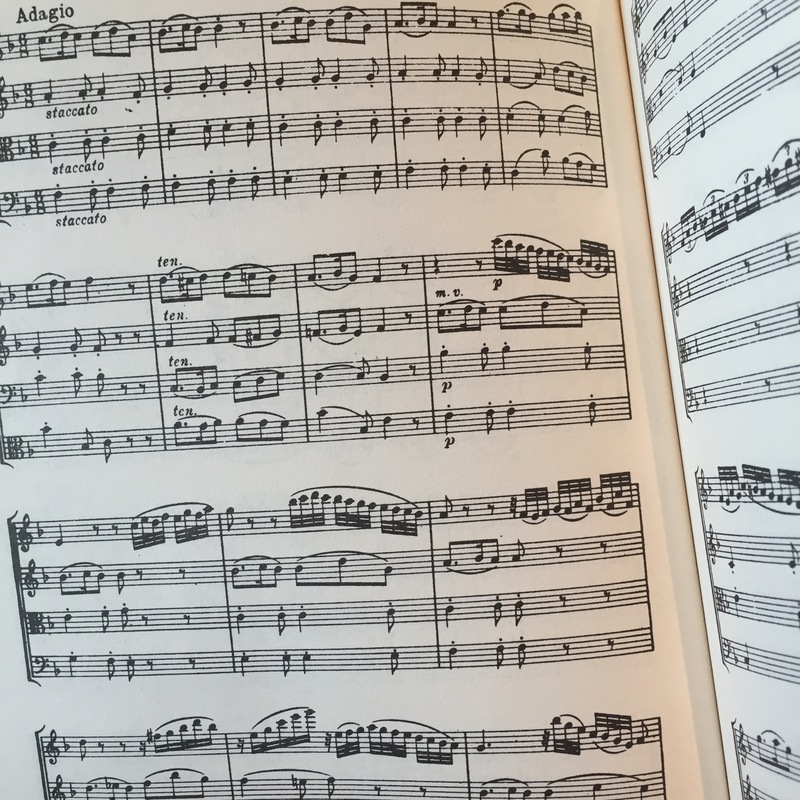 The transitional material between these two passages is wonderfully handled, as if Haydn is able to solve a tonal Rubik’s cube with just a twist or two and bring us to something so dramatically different. We go back to enjoy this contrast and drama again for the repeat of the exposition. This sonata form is such a clear example of how effective the form is, the journey it takes the listener on: to hear that bright, bouncy almost naïve major key theme be twisted and turned and succumb to darkness, becoming minor in the end, is a perfect, compact little tragedy, and quite easy to hear because of the great contrasts. Genius. The minuet has an interesting feel, and comes second in this work, and even it is full of contrasts, opening darkly, but giving us a wide range of expression and emotion in a compact 18 bars. There are both light and shadow, controlled and used effectively for what ends up being much more than a token minuet and trio. It’s rich and expressive, also with a sense of longing and even pain. The trio is something quite different though. There’s not a trace of threatening minor key, no pain, like a moment of repose, getting a letter from loved ones you miss in the humid Hungarian hell hole you’re in. The quartet, even in the trio, sounds more substantial than elsewhere, as if the instruments are being put to more economical, effective use, and it’s so easy to jump into the work and be engaged. There’s something about theme of the minuet that feels almost the slightest bit off-kilter, in the accents or phrasing somehow that borders on folksy or rustic, which is in keeping with the image I have in my head of the piece. It’s dark, but there’s something very human about it. If you’re not yet in love with this work, I don’t know what to tell you. We’re at the adagio now, a longer, more peaceful passage akin to the trio, but not as carefree. The first eight bars give us a pretty typical introduction to a 6/8 slow movement, but the violin takes a bit more spotlight here, sweetly, but also very interestingly. As below, in bar 9 you’ll see these sudden runs of 32nd notes that run all over the place. My first reaction to these was that they sounded almost comical, almost breaking up the slow, relaxed, more broad tempo, like a kid running around a room touching all sorts of things he might break. At further listening, though, it does afford a carefree lyricism to the movement that I got used to. After that carefree lyricism, we get something entirely different, a “fuga a due suggetti,” a fugue in two subjects. We’ve gone from a tragic, dramatic first movement, generally serious minuet, and a pretty relaxed, comforting slow movement to what now feels like a severe end to the work. But it’s an effective one, a short, quick movement that is also kind of subdued. It never really breaks out or explodes into any big climax. It is pensive, serious, and obviously musically genius. It might just be me, but flashes of the first movement and other bits flash before my eyes as the counterpoint flies by at full speed. This is one of the first quartets of Haydn (if not the first) that makes me feel I could keep coming back for more and learn more about not only the work (obviously) but, as cliché as it may sound, myself. What I mean by that is not some life-changing introspection, but perhaps more just identifying with the work, it coming to have some significance personally, some meaning, saying something to me that I’ll return to it now and again for a certain satisfaction. We’ve made it through almost two dozen quartets so far, and while that seems like a lot, we’re only about a third of the way through. I think I’ve said it before, but if they continue along this trajectory, we are in for some real treats for the late quartets. Stay tuned for a new focus next week. Say goodbye to Haydn for now… as things look, he’s not on the schedule anymore for the entire rest of 2016, but that could easily change.